Luca Pacioli’s instructions for printing leaves are very basic, but with a little modification and the use of polyurethane rollers results can be achieved that look ‘very natural’ even without colouring. Using commercial oil-based printing ink and the hand roller to roll out an even film, a composite blackberry leaf was laid top side down on the ink. 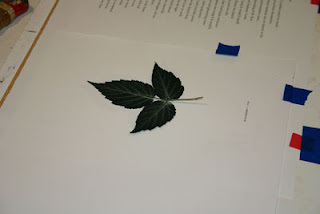 The back of the leaf was inked, using the roller, then lifted from the ink and placed on a sheet of paper, top side down. Another sheet, held in register in an improvised tympan with frisket was lowered onto the leaf. Pressure was applied using a roller and the tympan raised to reveal a print from the top (above) and the leaf adhering to the other sheet (below).